i notice most of us do not have a link to your build thread in your signature. is better than the 2nd post asking what year truck you have. i had to modify my signature line today (rip fiberglassforums.com ) and took a few screen shots of the process. 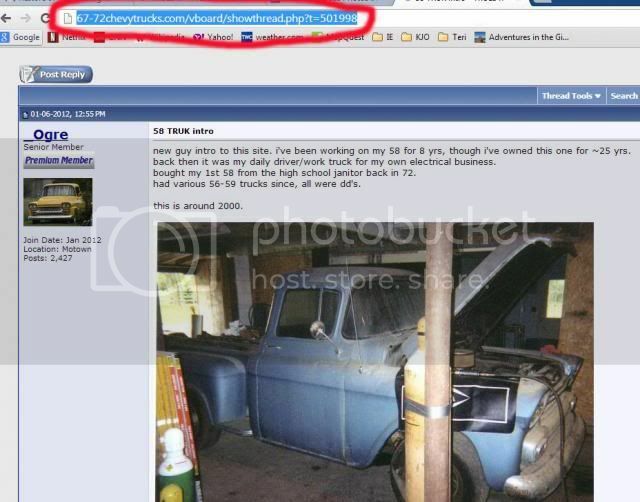 step 1: go to the first page of your build thread, click on and copy the header. i use chrome but it should be similar in all web browsers. click on the icon Insert Link that looks like a globe and chain link and a window will pop up like this. step 3: after you click on OK you will see this screen. it will show the link to your thread AND it will show a duplicate highlighted link to your thread. click on this Preview link and it should open a new window into the first page of your build thread. if your thread does not open in in a new window, something is wrong, go back to step 1.
then click on Save Signature button to save your signature. 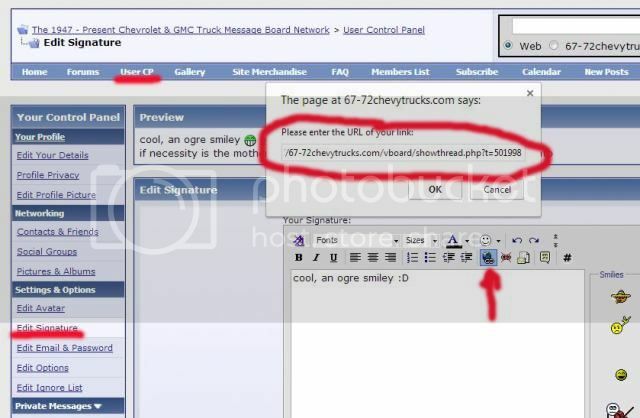 every thread you post to will now have a link to your thread, if you wisely put the year of your truck in the link everyone will know. Last edited by _Ogre; 04-13-2018 at 05:51 PM. step3 is also used anytime you want to insert a link into a thread post in any thread. copy the link, use the insert link button, paste the link, click ok and type the description you want. My building is going so slow on the 48 that I would have to post a "life gets in the way" thread. This 'easy" engine swap in my 71 is eating my time and extra cash to the point I can't even think about getting back on the 48. That would be nice to have to be able to see what someone is working on. My progress on the 48 is too minimal at the moment to warrant wasting space on a build page. The engine swap on the 71 has eaten all of the time and money earmarked for the 48 and the other projects and the end isn't in sight yet. I would much rather have everyone post info on the truck they are working on that brings them to this forum so we can more readily be able to answer a question that they present. 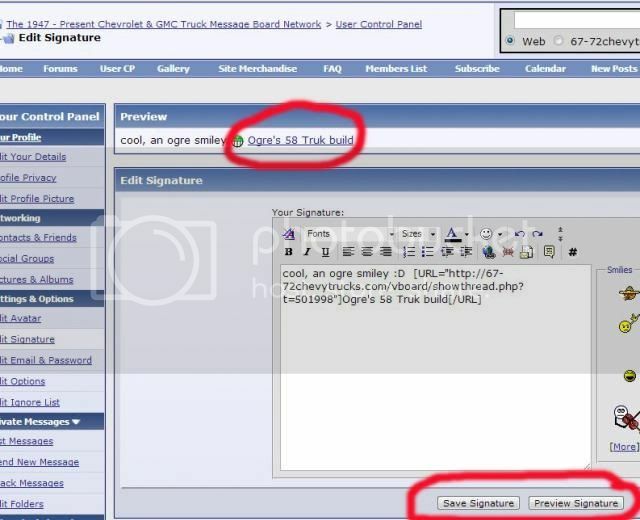 Being able to look at the signature line and see what their project is makes it a lot easier to answer a question and many guys do not have their trucks listed in their profiles so that really makes it hard give an answer when you have no idea of what they are working on. Sheesh! "Do this, do that, do it this way" A guy could get a complex with all the orders flying around! Ok, so I did it. Happy now? I've had mine in my sig for awhile, but i never update it. but your post got me to thinking ogre so i put a link to my album on here. So thanks for the idea. Great idea Ogre, it would help a lot for those of us that don't know what someone is working on. 1955.2 C4 Carry-all / Suburban ---> 55.2 Build Thread!! thank you for the info on how to do this, your the MAN!! Lol. Thanks ogre, i'm not sophisticated enough to pull that off from my phone . Now can you do something about the photo album link. I need some help here, when i changed my sig it worked in the preview, but now it does not work in a thread, screen says can not find server. i do not know how to fix this. any help please, thanks. Geeze, Ogre, I think I finally got the code right. I couldn't have done it without your explicit instructions! got it, thank you Ogre for your help. Ogre thanks for the help as I've been trying to figure out how to do this. The screen shots were very appreciated by us computer illiterate old farts. Regarding.... "click on the icon Insert Link that looks like a globe and chain link and a window will pop up like this. 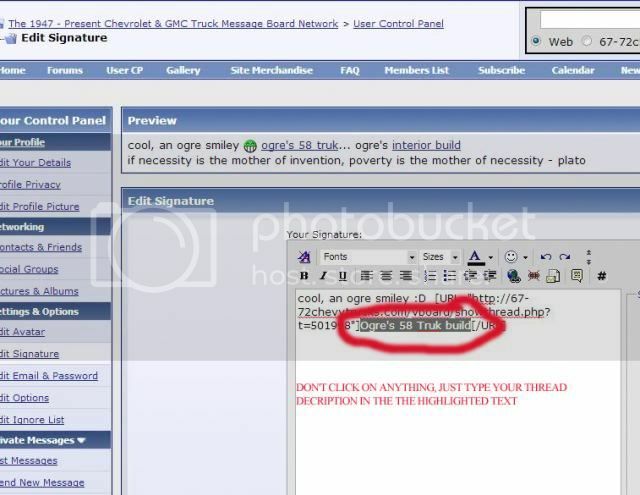 paste the text you copied from your build thread into the text box and click on OK to paste use what ever you use, i just click in the box and use Ctrl+v to paste" .....it always took me to a GCI website after it started to open. I finally just pasted the address directly into the box below the icon and it worked fine. Anyone else have this problem? you must be clicking on a different globe w/link command icon. if you mouse over the icon it will tell you what it is. 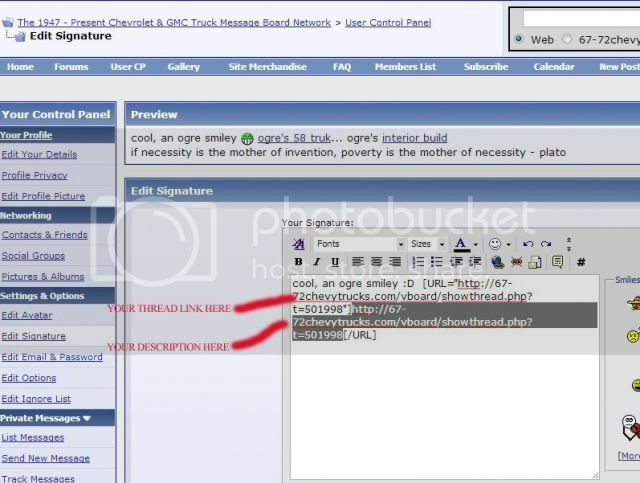 either way your project and a link to it is in your sig. Thanks for the info, the step by step with pictures made it easy! I took this personally..... and I should!!!! my bad. I'll give it a try later, thanks for the reminder Ogre. By the way, my spell checker says you spelled "should" wrong.